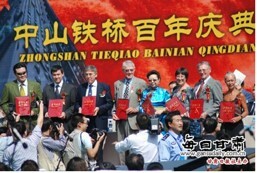 Lanzhou Bridge Centennial and Honorary Citizen Awards. The biggest event of the year was my August trip to Lanzhou, China. It was a memorable one. Along with seven other descendants of Paul Splingaerd, the subject of my book, The Belgian Mandarin, I was invited to the celebration of the 100th anniversary of the “First Iron Bridge Across the Yellow River” that Paul had proposed for the city of Lanzhou. Today it is known as Zhongshan Qiao (Sun Yatsen Bridge). We were given the unexpected honor of being conferred honorary citizenship to the city. The televised event in front of dignitaries, drummers (not as many as at the Olympics, but quite impressive), a full orchestra, and fireworks, made us feel quite special. We were guests of the city for the duration of our stay, and were treated to numerous banquets-with the mayor, and Foreign Affairs Minister. We literally got red carpet treatment. For me it was also an opportunity to see my Nainai (grandmother) Anna’s family again after finding them in 2005. Left to right: Gerald Keet of Thailand, Dr. John Keet of London, Alan Keet, OBE, of Singapore, behind Angela Elliott of Vancouver; Alan’s wife, Margaret in front of me, Frank Keet of Perth, Denis Keet of Malaysia, Uncle Zhang Daquan of Xian, Uncle Zhang Xue Xin, and his wife. Gerald and Denis are sons of Alan and Margaret. 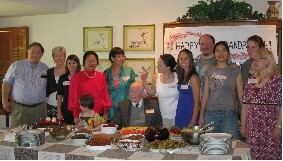 In May we celebrated Grandpa Joe’s 90th birthday. My brother Peter, his wife Alice and her daughter Anna came from Phoenix. Peter’s daughter Tara came from Boston with Grandpa’s beautiful great granddaughters Sidney and Catherine. Andy and his wife Alice Yuan came down from Seattle. 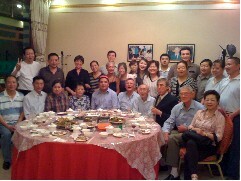 Other relatives, good friends, & neighbors also joined the celebration. Andy and Alice had reasons to celebrate in Seattle as well. This summer Alice Yuan got her green card, and there’s a new lady in Andy’s life, the Coconut Queen (ok, ok, she isn’t really a lady, she’s a new game he created) was released in August.A&A celebrated their first anniversary in September. Here are Andy and Alice at Grandpa’s birthday. Alice is lounging in the “Huggmee” chair that is Peter’s exclusive creation. The one she is in was custom made for me by Peter and Mike. Visit Peter’s site www.huggmee.com for more information about his chairs. Christian has been working tirelessly on the family website, www.goens-pourbaix.be, for many years, and keeps it up do date with family history, geneaology events, and documents. Check it out for new findings on the notable Paul Splingaerd from different sources, new photos, and a report on the Bridge Centennial, as in the photo below. Christian and I are working on getting an entry on Paul Splingaerd into Wikipedia very soon. 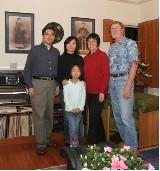 Liu Xing, the daughter of Aunt Zhang Jian Qin and Uncle Liu Guang Hua has been living in Plano Texas for a few years. Her engineer husband Neng Jiang began working for Northrup Grumman in the LA area in October. We hope to see much more of them when the family finds a house out here. Their daughter Sophia is in front of Xing. We will meet college student Amy at Christmas. Cindy and Shawn moved to Dubai from Abu Dhabi after Shawn left Taqa. At left is the view of Palm Island and Atlantis from their new apartment at the marina. They also have a grand view of the mile-high Burj Dubai from their apartment. Shawn is starting a new business in Dubai with associates. Cindy’s work for Mercer travels with her, except on their relaxing vacation week in the Maldives (photo at right), which they wanted to see before it becomes submerged by global warming. A quiet but significant occurrence this year was the fact in October I qualified to carry my own Medicare card. We hope this find you well and enjoying the holiday season. May 2010 bless you and yours with abundant joys, including good health and success in all you do.